A fanny pack. Mine is a dark color that can double as a purse or shoulder bag. 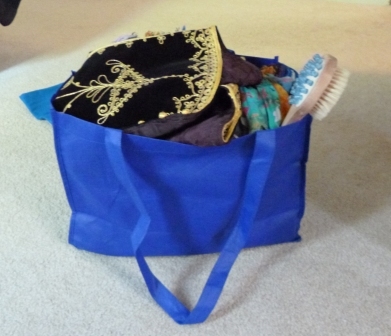 It has lots of zippers, easy-access compartments, an adjustable strap with a sturdy clasp, and room for a water bottle. A flashlight in the fanny pack – in Spanish toilets sometimes the light is on a timer and goes out unexpectedly, sometimes the switch is on the outside and a well-meaning user turns the lights off on exiting, sometimes there is no window and you need a flashlight to find the light switch. Bandaids and anti-biotic – you hope you won’t need these, but in my case , both came in handy when I bumped the mirror in our Caceras hotel room and then caught it one-handed as it bounced. It only sliced a bit of the web between two fingers, and the Band-Aids and ointment eased both pain and anxiety. A shirt jacket with a pocket on the front big enough to carry your camera – easy to get to, but out of sight, so you don’t scream “Tourist!” to every passerby. A dark color looks dressier in an urban setting, and is practical; a light color is more comfortable in heat. Sensible shoes The best are shoes that can pass for urban wear, but stay comfortable on a hiking trail or after a day trekking in museums. I swear by SAS Freetime, the classic worn by nurses in white and little old ladies in beige and me at countless trade shows and on myriad business trips in black or navy. Six layers of clothing are rounding me out and keeping me smiling in the snow! Cargo pants These are great for wear in rural areas where you are hiking, biking, or scrambling over cobblestones. The extra pockets can carry what you need and leave hands free. Dark Casual Pants. These should have deep pockets for your wallet, but look like ordinary daywear for the urban areas where you don’t want to advertise that you are a tourist. Kleenex packs – you cannot count on finding tissues in the hotel, or toilet paper in those bathrooms. Compact tablet computer. I filled mine with free books and read them on the plane and bus trips. W loaded hers with tour books. In both cases, we saved space by not carrying the actual books which are heavy and bulky. And of course don’t forget to bring the charger. International Transformer/Adapter American plugs don’t work in Spain, and American power requirements can cause a hotel blackout in rural areas. In a larger hotel in Madrid you can borrow an adapter from the concierge, but not in the smaller towns. Tops: regular underwear, silk long-johns, a knit turtleneck, a long-sleeved collared cotton shirt, a long-sleeved knit crew-neck shirt, a fitted knit hoodie, and a water-proof hooded wind-breaker. I never had to use all 7 top layers, but I came close. Map Even if you have a GPS in the car, even if you have Google Maps on your iPhone, a real paper map is invaluable for giving an understanding of distance and direction. You can see how the distance you plan to travel today compares to the distance you traveled yesterday. You can see whether a suggested side trip is a reasonable distance. If the map is a good one, it will also give you an idea of the topography, and tell you the names of those distant mountains. The one I brought was folded and re-folded until it was falling apart at the seams. Scarves/Buff – neck warmers are key to sealing in whatever warmth your poor body can generate when you are caught in a cold drizzle or snow flurry. A Buff can double as a hat or earmuffs. 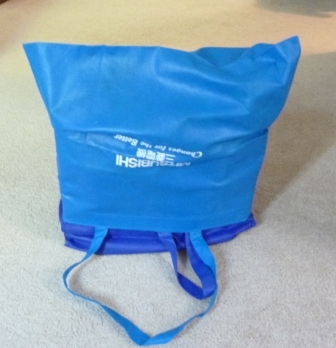 Collapsible Suitcase/Tote Bag Here’s a space-saving trick to provide extra carry power: Pack two large poly-fiber grocery bags (the kind you take to the market instead of getting paper or plastic). They take up scarcely any space. One of these can serve as a handy carry-all for a day trip. 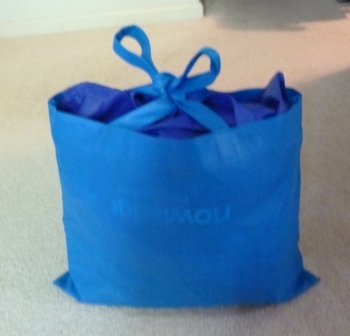 If you have purchased presents that overflow your suitcase for the return trip, you can pack the presents into one of the bags, put the second bag upside down over the first one, then invert the whole thing and you have a tidy package with handles which you can carry on as a personal item.